Ommmm. Don’t worry; this tool is not esoteric. If you show it your images, it tells you the respective location of their visual center. This allows for more harmonious presentations. 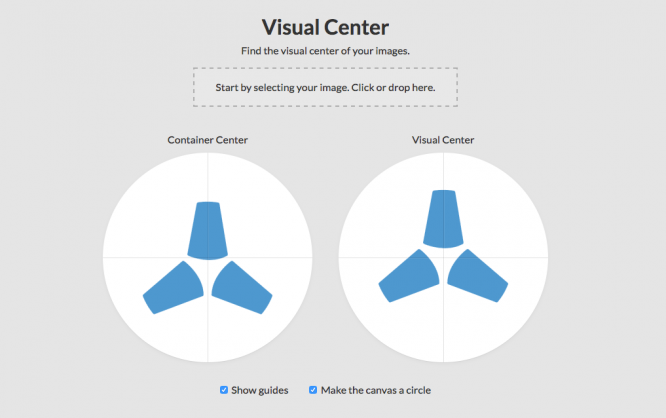 “Visual Center” is a web app that shows you the visual center of your pictures. To do so, upload an image to the service. The app takes care of the rest. Immediately after the upload, you’ll see two versions of the uploaded image. On the left, the photo or logo that you uploaded is centered in the middle of a container. On the right, the picture is placed in the same container but aligned in a way that makes it visually centered. Usually, this alignment is different from the one in the left area. “Visual Center” slightly changes the photo’s position both vertically, and horizontally. In my tests, the values were never really high, but it did always change them by about five to ten percent. Instead of a rectangular container, you can also choose a round one, making some logos easier to judge. The display of lines for the horizontal and vertical center can be turned off if necessary. According to Javier, he’s already working on plugins for Sketch and Illustrator. If you want to be one of the first to be notified once they are available, you should sign up for his email newsletter. Javier promises to only use your address for his own purposes and to not sell your data.